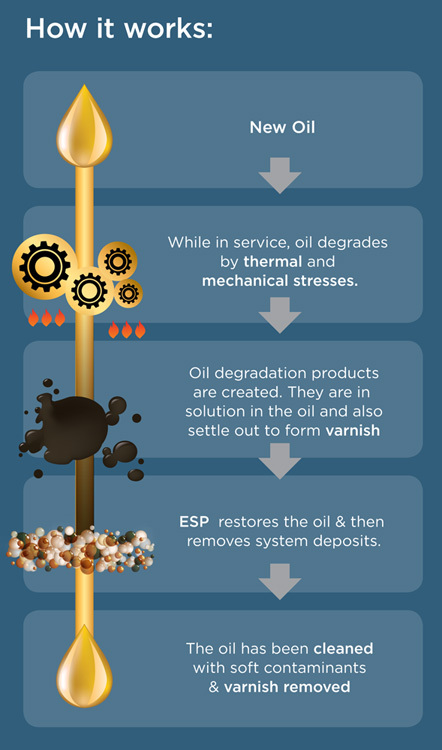 As oil in your machinery breaks down, it produces soft contaminants both in solution and in suspension. It’s these contaminants that ultimately cause varnish. The Fluitec ESP system captures these contaminants by virtue of a special chemical filter that works on the principles of chemisorption and adsorption. Depending on the contaminants you’re trying to control, this filtering media can be customised to remove the exact contaminants you need to control. ESP can be customised to capture all varieties.